Road design and treatments play a significant role in preventing crashes and minimising the severity of injury if a crash occurs. Safe road design prevents unintended use and encourages safe behaviour by users. Urban driving generally involves higher volumes of traffic, numerous intersections and increased road use by pedestrians and cyclists compared to rural areas. The majority (84%) of minor injuries occur in the Metropolitan Adelaide area. In contrast 43% of all fatalities and 56% of serious injuries occur on Metropolitan Adelaide roads. Almost half of all serious casualty crashes occur at intersections and most likely to occur on a 60 km/h road. The most common type of serious casualty crash in the metropolitan area is when a vehicle collides with a fixed object, most common objects being struck were trees and poles. Just under half of all serious injury crashes in metropolitan Adelaide occur at intersections. Around 37% of these crashes occur at signalised intersections and the remainder at intersections either with no control, Stop signs, Give Way signs and at roundabouts. Read our fact sheet for more information on Metropolitan Adelaide road crashes (PDF, 1243 KB). Higher speeds travelled on rural roads result in more severe crash outcomes. Historically, there are more fatalities recorded in rural South Australia than metropolitan Adelaide, whilst almost half of serious injury crashes occur in rural areas. The most common casualty crash types on high speed rural roads is when a vehicle leaves the road and hits a fixed object, such as a tree, or results in a vehicle rollover. Read our fact sheet for more information on Rural road crashes in South Australia (PDF, 1215 KB). The key strategies for creating safer roads are outlined in Towards Zero Together, South Australia's Road Safety Strategy 2020 and subsequent Action Plans. The Government of South Australia is addressing a range of priority infrastructure programs to improve road safety. 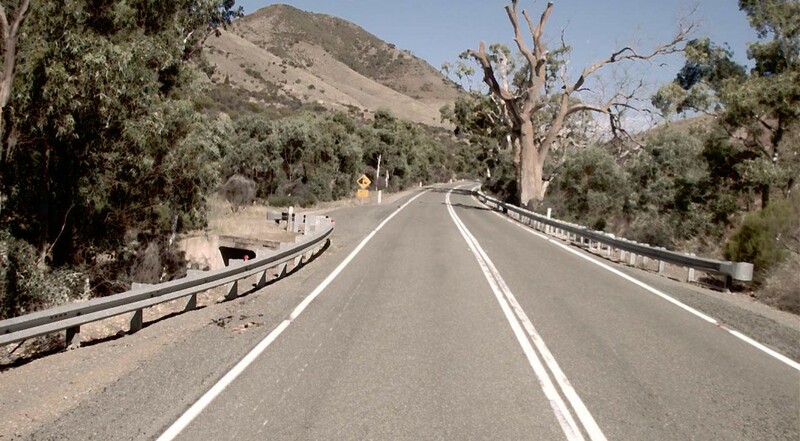 Black Spot Programs directly target improvements to the safety of roads with proven crash history or high-risk locations and are a vital part of the State's commitment to improving road safety and reducing road crashes and trauma on South Australian roads. 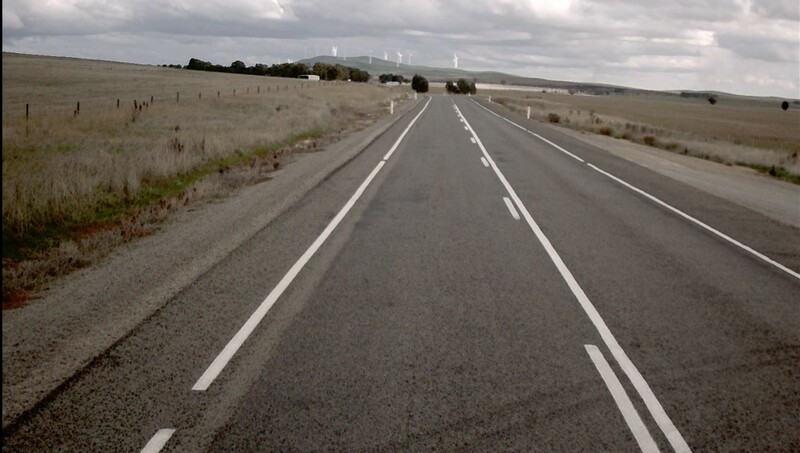 Shoulder sealing is aimed at improving the safety of regional roads by sealing the road shoulder to provide a seal width that allows greater opportunity to recover safely if the vehicle moves from the traveling lane. A common cause of crashes on country roads is running off the bitumen on to the soft edge then over-correcting steering to the right or braking too hard. Shoulder sealing on rural arterial roads has the potential to reduce crashes by more than 40% by providing additional safety margins when vehicles run off the road because of driver fatigue or errors in judgement. Factors to determine priorities for roads for shoulder sealing include casualty crash rates, the road function, the density of roadside hazards such as trees or drop offs and the volume of vehicles on the road including the percentage of heavy vehicles. Copper Coast Highway, between Paskeville and Kadina. Farrell Flat Road, Clare and Farrell Flat. Riddoch Highway, between Willalooka and Padthaway and between Keppoch and Naracoorte. RM Williams Way, between Clare and Spalding. Tod Highway, on curves between Lock and Tooligie. Hitting a fixed object, rollover and head on crashes are the dominant crash types in rural South Australia. Roadside barriers are used to reduce the severity of each of these crash types. 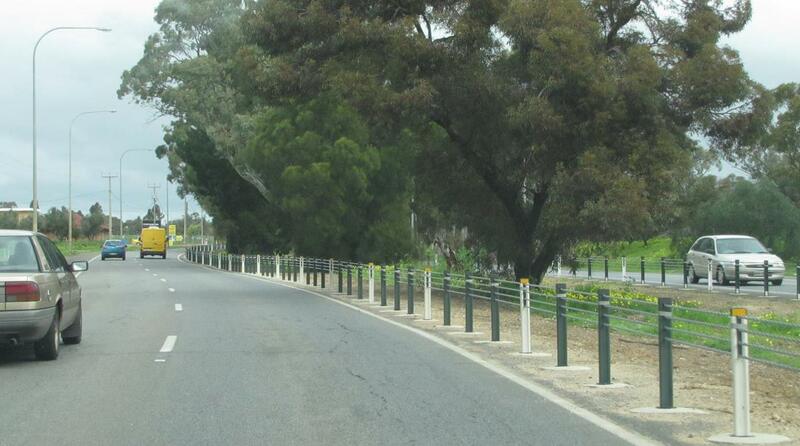 Wire Rope Safety Barriers (WRSB) were installed on Main North Road, Smithfield Plains, in 2014. The barrier is designed to absorb crash energy with the aim of reducing crash severity compared with a crash involving hitting a tree in the central median. 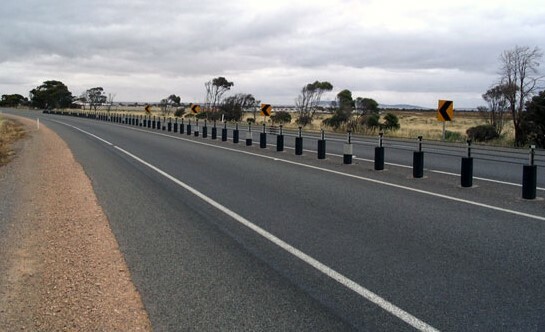 Another example of WRSB was the installation of 2.3km in the central median on Victor Harbor Road, Willunga Hill, in 2013 and earlier in 2010 on Port Wakefield Road, just south of Port Wakefield. The wire rope barriers in this instance were installed to reduce the likelihood of head on crashes. Guard rail, or w-beam, is more often installed on windy roads where roadside hazards are near the edge of the road. Similarly to WRSB, guard rail is designed to reduce crash consequences by absorbing crash energy. Motorcyclist safety has also been improved through the use of motorcycle protection on roads in the Adelaide Hills with high motorcycle crash rates. There are many other rural intersection upgrades, such as new channelized right turns at the intersections of Williamstown Road/Springton Road and Tea Tree Gully –Mannum Road and Chain of Ponds-Cudlee Creek Road and more innovative treatments such as vehicle activated signs installed at the intersection of Riverview Road, Pfeiffer Road and Woodside-Nairne Road. A unique raised platform at the junction of Rundle Street and The Parade West in Kent Town was completed in early 2015, and is the first of its kind on an arterial road in South Australia. The platform requires motorists to slow down as they enter this junction and works in a similar way to a speed hump, with the key difference being that the entire junction is raised. 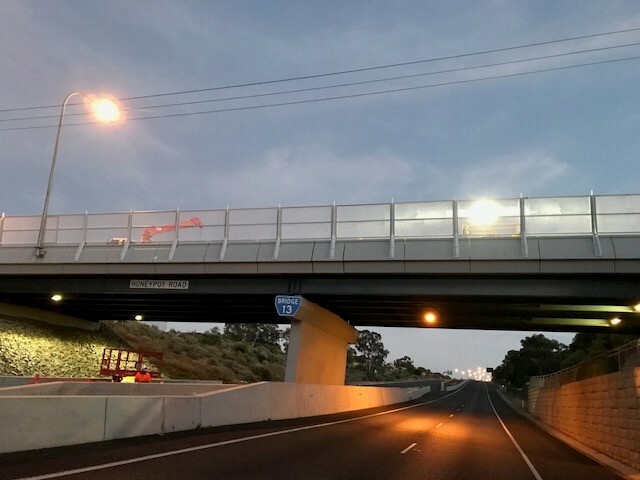 The project included the installation of signs alerting motorists to the platform, upgrades to lighting at the junction and improvements to the local drainage system. Wherever possible, the department works with SA Power Networks to underground power on major projects such as Adelaide’s North-South Corridor and via the PLEC Program to remove a roadside hazard. Light poles on arterial roads are designed to either slip off at the base or crumple when struck.